Market turbulence is unavoidable and nearly certain over the long run. However, it’s important to make the most of the opportunities presented during these volatile times. In the 4th Quarter of 2018, the equity markets experienced 12 days of greater than 2% price movements and VIX readings (a scientific measurement of market volatility) in the upper 20s. While neither of these figures is historically alarming (the historical average VIX measurement is 19.26), after an extended period of complacency leading up to the 4th quarter of 2018, equity prices decreased dramatically during December. In fact, it was the worst December since 1931 for the S&P 500. Whenever we need to harken back to the Great Depression for comparable market environments, we certainly know that it’s time to take a look at our portfolios and see what opportunities exist. Tax loss harvesting is a common strategy in the investment world, and one that can generate value to investors by lowering the tax drag on their investment portfolio caused by realized capital gains from trading activity and capital gain distributions from mutual funds and other collective investment vehicles. When selling an asset that’s net proceeds are below the cost basis of the asset (generally defined as original cost of the investment plus any dividend reinvestments), the difference is a capital loss. If the investment has been held for a year or less, it is considered short-term loss. Those held longer than one year are classified as long-term. In computing your income taxes, short-term gains and losses are first netted against each other, as are long-term. The resulting net short-term and net long-term capital losses can then be netted against each other. As such, any capital losses that have been proactively harvested are available to offset capital gains, which might otherwise have been taxable at tax rates exceeding 30% when factoring in Federal and state income taxes. Staying active with a tax swap. At Sanderson, we like to take tax loss harvesting a step further by advancing to what we like to call tax swaps. Rather than letting the proceeds from the tax loss harvest sale sit uninvested on the sidelines, we use the proceeds from the sale to purchase (i.e., “swap” into) a highly correlated investment that should continue to perform substantially similar to the one just disposed of. In fact, due to the nature of collective vehicles like ETFs and mutual funds, the underlying exposure we are able to achieve for our investors is very similar to the original investment. 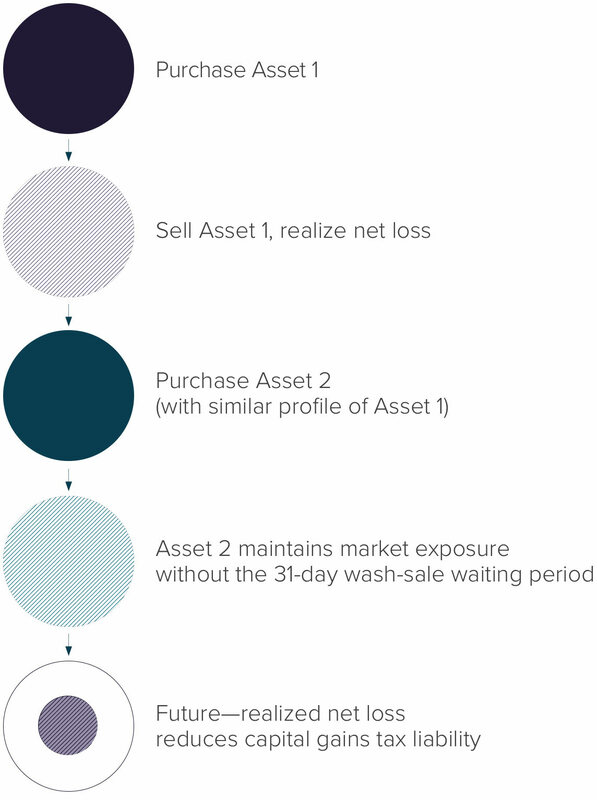 An investor cannot simply sell and repurchase the same asset, as that would trigger a wash-sale, as defined by the IRS, and the capital loss would be disallowed for income tax purposes. Without a comprehensive understanding of the correlations and financial profile of replacement investments, or perhaps because some advisors lack the open investment architecture to select suitable replacements, many investors will wait out the wash-sale window during tax loss harvesting and repurchase the same asset after waiting the required 31 days. During this time, the proceeds from the loss harvest typically sit in a money market fund or other cash sweep vehicle, waiting for redeployment back into the market. This lack of market participation can potentially be devastating to your overall return as an investor, as often times the market recovers very quickly after its steepest drops. Example of a successful tax swap. For evidence of this, let’s take a look back at a real-life example of our firm’s tax loss harvesting and tax swap activities in December 2018. As many investors and advisors were preparing to see their friends and family over the holiday season, the market continued its December decline into the Christmas week. The dip became severe and accelerated into the close of the Christmas Eve trading session, with investor sentiment falling throughout the day. Although intended to provide reassurance to investors, Treasury Secretary Steven Mnuchin’s comments that day regarding bank liquidity and capitalization levels provided further damage to already cynical investor attitudes. At the close of December 24, the S&P 500 was down 10% for the month. After the Christmas holiday, the markets re-opened on December 26. Rather than observing significant sale orders continuing to move the market down, as many investors and stock market prognosticators anticipated, we instead saw huge purchase orders being placed (Wells Fargo’s Pravit Chintawongvanich estimates $60bn), rocketing the market up throughout the day, with the S&P 500 gaining nearly 5% during the trading session. The chart below illustrates the difference between a traditional tax loss harvest and our approach of a tax swap during this period of volatility. Being proactive and sticking to the long-term strategy. While the financial advantage of the tax swap strategy is certainly amplified during periods of extraordinary market volatility (downwards and upwards), it demonstrates the potential extra value of taking what the market gives you, while sticking to your long-term strategy of being a market participant. While both strategies have a capital loss of $10,000 on the books for the 2018 tax year, the tax swap strategy has the investor $8,456 ahead by the end of the 31-day wash sale window on January 25, 2019, while the traditional tax loss harvesting strategy investor has sat on the sideline waiting for the wash-sale window to close. We believe this generates tax Alpha for our clients (i.e., additional investment return related to tax sensitivity or strategies) since we have the same tax asset, but also maintain the equity market exposure and asset allocation targets that the portfolios risk and return objectives prescribe. Had the markets continued their declines, or perhaps stayed flat for some time, it would have presented new opportunities for further loss harvesting or reinvestment back into the favored fund. Regardless of what the markets did, it was important to us to be proactive in evaluating the opportunity for each of our clients, to make the most of the market conditions that had evolved, and to continue to focus on long-term goals and investment objectives for our clients. All investments contain risk and may lose value. Past Performance is not a reliable indicator of future results. This publication contains general information that may not be suitable for everyone. All material presented is believed to be reliable; however, accuracy cannot be guaranteed. The information contained herein should not be construed as personalized investment advice. There is no guarantee that the views and opinions in this publication will come to pass. Schedule a consultation to learn more about our investment services.